I’m sure you’ll agree that a wrench set must have the right number of pieces, a great warranty, and SAE sizes. That was our top criteria for selecting the best wrench set. If you want to cut to the chase the Craftsman Wrench set scored high above the others we tested in all categories and is our top pick. This 26 piece set has both SAE and metric so we were prepared for any situation where a wrench was needed. Wrenches are one of the standards in most tool boxes. They have a variety of uses for inside and around your home or worksite and even in the workplace. When you invest in a good quality wrench set, you will be a lot more likely to have the right sized wrench for any job no matter what it is. Being prepared in this manner can get rid of the frustration experienced when you need a wrench and find out that you don’t have what you need. There are several things that you will take into consideration when you start looking for a good quality wrench set. Things such as the type of measurement you prefer; metric or standard, what size and shape wrench you want, whether you want a ratcheting wrench and so on are all factors that play a part in what wrench set you choose. Making sure you purchase a good quality, durable wrench set is important so take time to read these reviews and the buyer’s guide below before you make your wrench set purchase. Craftsman is a well known and well respected name in tools. 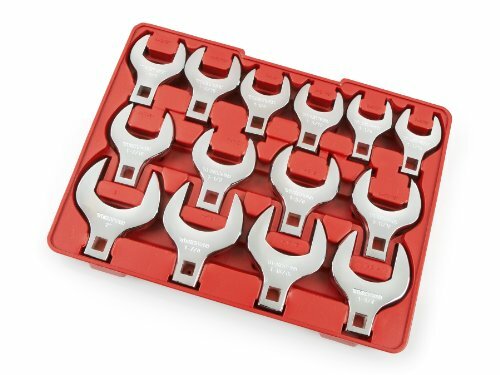 This 26 piece Metric 12 pt combo wrench set provides all the wrench power you need for your tool box. You get 26 wrenches in this metric set. The box end provides 12 points for more angle choices and less swing of the wrench. What this means is you get more results for less effort. The open end of the wrench grabs fast in areas that are small. The markings on the wrenches are easy to read and very clear. The rugged steel build of these wrenches need very little maintenance with a combination of rough and smooth finishes in attractive chrome. This valuable set stands up to tough torquing for those hard jobs where you need a lot of strength. 7, 8, 9, 10, 11, 12, 13, 14, 15, 16, 17, 18, 19, 20, 21 and 22mm. 4, 4.5, 5, 5.5, 6, 7, 8, 9, 10 and 11mm. This whole set packs up neatly for easy carrying and stays organized so you can always grab the wrench you need quickly. 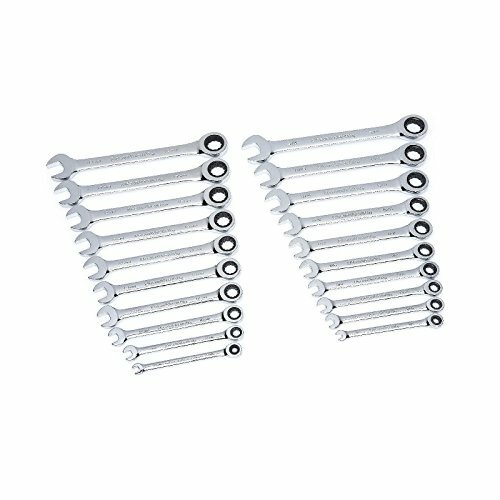 If you are looking for a well rounded metric wrench set, you will find the Craftsman 26 piece Combination Wrench Set. When you are trying to get to fasteners in awkward, small spaces, what you need is the TEKTON 14 pc ½” drive Jumbo Crowfoot Wrench set. The chrome plated finish easily resists corrosion so your wrenches last for years. 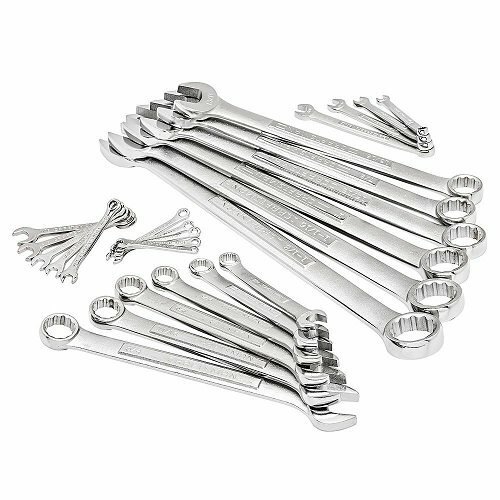 You can use these SAE wrenches with any ½” drive ratchet extension or torque wrench. You will be able to reach fasteners that other wrenches simply can’t reach due to the constrictive spaces. Made from forged steel that has been hardened, this set from TEKTON is built to stand up to heavy use and last a lifetime with proper care. This is a great SAE wrench set to compliment your other tools so you are prepared for any wrench task you could have come up. These make a great gift as well for professionals and DIY-ers as well. The GearWrench 20 pc ratcheting wrench set is just the thing to ensure those bolts and nuts of all sizes are securely in place. A slim headshank will allow you to access these bolts regardless of whether they are in tight spaces or not. This set is both metric and standard so you don’t have to choose one or the other and will be prepared no matter which it is. All 20 of these wrenches require a small swing arc to tighten them so you will get a lot more work done with a lot less effort. SAE: 1.4, 5/16. 11/32, 3/8, 7/16, ½, 9/16, 5/8, 11/16 and ¾ inches. The ratcheting box end will move the fastener fast and easy and the surface drive box end will give users a strong grip and eliminates rounding. This wrench set is just the thing you need to ensure that all your wrench needs are met. Wrenches are a much needed staple in the tool box and having a good, complete set of them can make any jobs and tasks that require tightening fasteners or making repairs a lot easier. With so many different wrench sets on the market today, choosing the right set may seem like a complicated undertaking. The top rated wrench sets featured in this review are great additions to your tool collection. They are durable, made to last and made to make your repairs and tasks much easier. If these top rated choices are not what you’re looking for, read our buyer’s guide below to learn how to choose the right wrench set for your specific needs. We will help you get the information and knowledge you need to make an informed choice and purchase the set or sets that will provide the wrenches you need at the quality you want. There are many different types of wrenches on the market today. Some are used for DIY applications, others are used for auto repairs and those types of applications. We’ve outlined the most common types of wrenches available. Open Ended/Crescent Wrench – Another name for these open ended wrenches is C Spanners. They come in many different sizes and are considered the most versatile and common wrenches available. The open end that is shaped like the letter C, isn’t as strong as the box end of the box wrench but they are much faster. Crescent wrenches are made of cast iron, wrought iron or alloy steel and they are almost indestructible. Some crescent wrenches have a wrench opening at both ends of different sizes. Box Wrench – Box wrenches, or ring spanners as they are also called, are typically made of steel. They are used to tighten and loosen nuts and bolts. The head is enclosed and it is much stronger than an open end wrench. They are a little bit harder to use and must be aligned from above. Combination Wrench – Just like the name describes, a combination wrench has a crescent at one end and a box at the other end. Both ends are the same size. They are good to use in conjunction with each other. For example, loosening the nut with the box end and then finishing unscrewing it with the open end. Many people like combination wrenches because they have both types to use so they can use both if needed and it’s on one tool for convenience. Adjustable Wrench – adjustable wrenches are typically open ended and one jaw is adjustable and moves open and closed. They are designed to fit a variety of nuts and bolts and are not confined to a specific thread system. Adjustable wrenches are available in many different designs. You will need to be careful not to damage or over extend the jaws of the adjustable wrench or it will not work properly. Pipe Wrench – Pipe wrenches are designed to grip and turn objects like pipes that need to be repaired or that need to be tightened when they have been replaced. Pipe wrenches should not be used on undamaged nuts because the jaws of the pipe wrench will damage it. When using a pipe wrench, apply pressure in the direction of the wrench jaw’s opening. Pipe wrenches come in a variety of sizes. Offset Wrench – An offset wrench has a head that extends about ½” of the wrench end so the user’s knuckles to have room so they are not getting scraped during use. You can also reach into places that are difficult to get into and over obstructions as well. Now that you understand a little bit about the different types of wrenches that are available, it’s time to learn how to choose a wrench set for your own tool box or home. Each type of wrench has its own characteristics that make them suitable for specific types of tasks and repairs. Size and Shape – If you’re looking for a versatile wrench that can be used for a lot of different tasks, the adjustable wrench fits the description. They are not as strong as the fixed type of wrench but if you want something that is good for DIY projects and is compact, the adjustable wrench would be a good addition to your tools. Make sure you get a few different sizes. If you’re looking for something really strong and durable, choose a fixed set. The most common type of fixed set is the combination wrench which has a C spanner and ring spanner in the same wrench. One end will have the C spanner and the other end will have the ring spanner. Get a set that will match the frequency in which you’ll be using them. If you will be using wrenches often, you should look at the sets that have a lot of wrenches in them. Metric or Standard – The head of a wrench is measured in one of two sizes: metric or standard. Metric is measured in millimeters and standard wrenches use inches for their measurements. Most people have a use for both metric and standard wrenches and get a set of each or a set that has both for their homes or workshops. Durability – If you are looking for a corrosion resistant set of wrenches, look for those that are made from chrome vanadium or chromium vanadium which are considered high quality. Chrome plating adds corrosion resistance that allows your wrenches to last years. Another material used for wrenches is cast iron or wrought iron which us even more durable than the chrome sets. Below are some basic tips that users should follow when using wrenches regardless if the kind you choose to purchase. Choose the right wrench for the job at hand – You don’t want to damage the fastener you are working with nor do you want to hurt yourself. Make sure that you choose a wrench that matches the fastener you are trying to tighten or loosen. Ensuring that it is the right size will reduce the chances of you having the wrench slip and hurting your knuckles. Pull the wrench, don’t push it – Be sure to pull the wrench towards you instead of pushing it. This will prevent you from smacking your hand if the wrench slips off the fastener like it can do when you are working with a particularly difficult one. If you have to push the wrench, use the heel of your hand and if it slips you will not hurt yourself. Don’t hit the wrench with a hammer – Unless the wrench you are using is a strike face wrench that is designed to be hit with a hammer, do not hit your regular wrenches with a hammer to get more power. This can damage the wrench, the hammer or yourself if you are not careful. Never use a damaged wrench – If the jaws look wider than they are supposed to, or the adjustable part of the wrench is loose or the handle is bent, do not use the wrench. It is better to replace it than risk injury by using a wrench that is messed up. Get the best quality you can afford – Tools are not something you should skimp on when it comes to quality. Good wrenches work better, last longer and typically provide better warranties as well. Most of the time, the more reputable and well known companies offer excellent support and customer service in the event one of their tools has a problem. This is not something that cheaper tool companies offer. Take care of your wrenches – Have a case or tool box to keep your tools in. Even though these wrenches are usually made of indestructible materials, you can still chip the plating which can allow rust to creep in and ruin your tools. Keeping them in a tool bag or tool box when they are not in use will ensure that they last years to come. You will also always know where they are if you are consistent about making sure they are put away after use. A wheelbarrow is very useful for those smaller hauling and clearing jobs that you may have around the worksite, home or garden. You want to be certain that the wheelbarrow you purchase is suited to the different types of projects you want to do. Whether it’s hauling gardening supplies around or clearing brush or moving dirt or mulch, a good quality wheelbarrow will make all of those jobs much nicer and easier too. The top rated wheelbarrows that we’ve reviewed here and the information contained in this buyer’s guide are designed to help you understand the features and traits that good quality wheelbarrows can have. When you have the right information, sorting through all of the different styles and choices is not hard at all. You’ll be armed with the tools to make an informed decision and have confidence that your decision is the perfect one for your needs.